Well guys, Spring is officially here and has brought it's side-kick, spring cleaning! Hooray for that! Nothing gets me more excited than kicking it up a notch on my cleaning routine! I started my spring cleaning in our laundry room and figured I'd write a post about how to keep the laundry room clean and organized. If it's easy to ignore any room it would be the laundry room. After all, no one really sees it (beside the person doing the laundry) so it's easy to just say, "out of sight, out of mind." But I'm going to show you some tips and tricks to whipping this baby back to shape and keeping it there! Just a few easy tasks here and there can make a difference in how you see your laundry room. 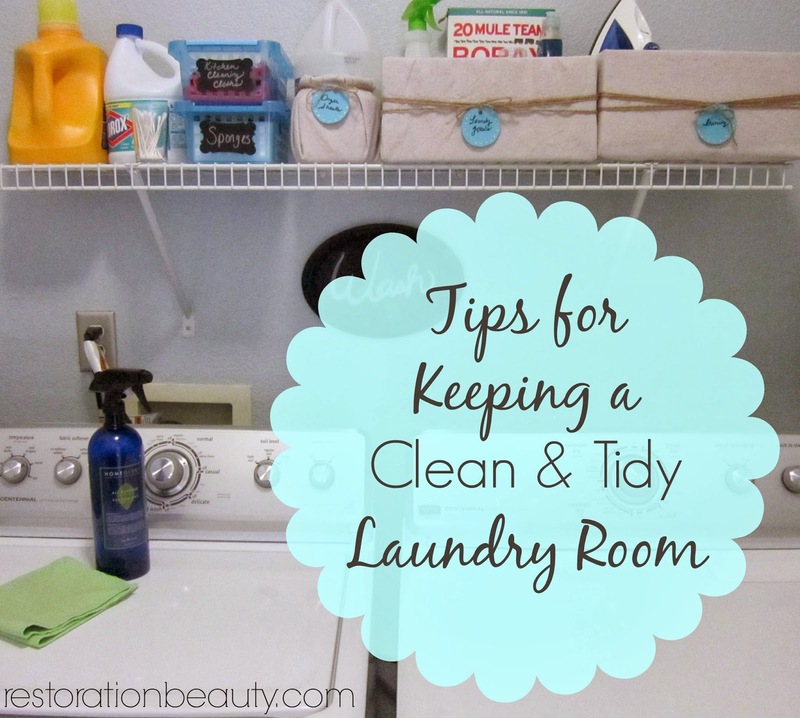 I gave my laundry room a little makeover last year and was determined to keep it looking nice, clean and organized! Let's just get it over with and begin with the dirtiest tasks, shall we? 1. 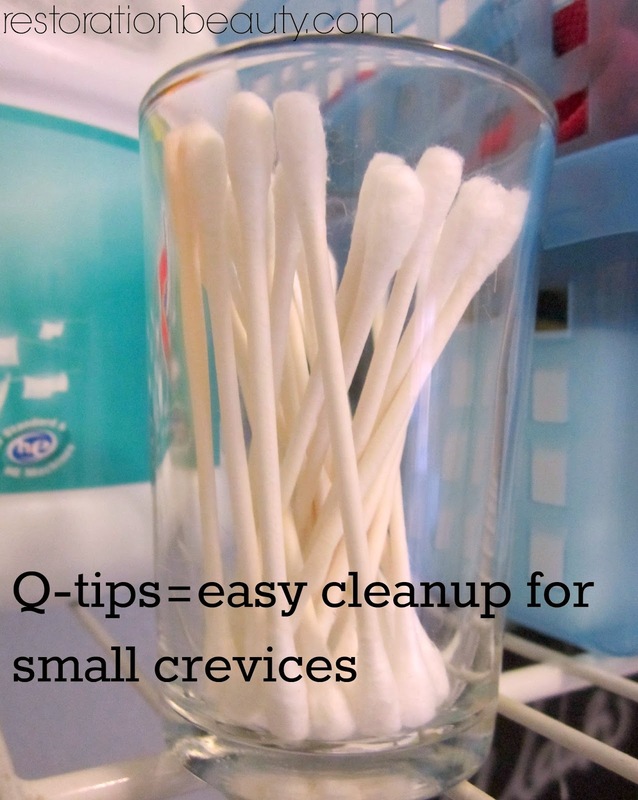 Keep some q-tips in your laundry room cleaning arsenal. They're perfect for cleaning those hard to reach crevices that are easy to look past. 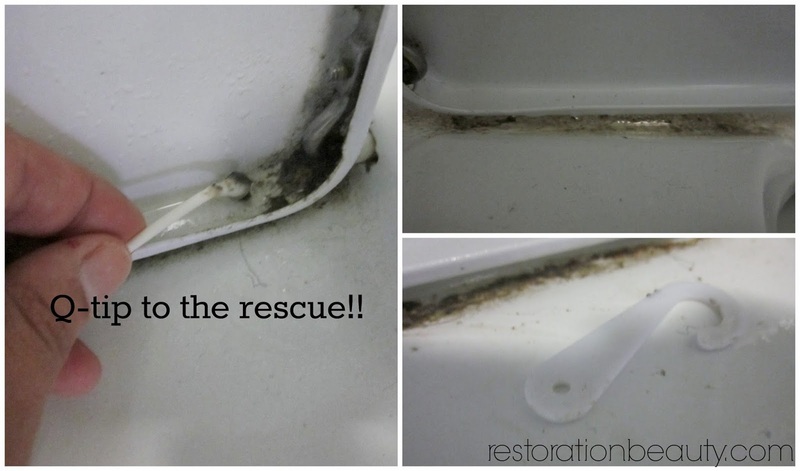 You can use q-tips to clean the inside rim of your washer, the area that is hidden under the lid, or any other hard to reach crevice. These areas get DIRTY! Like disgusting dirty. Warning: it's about to get real up in here. 2. 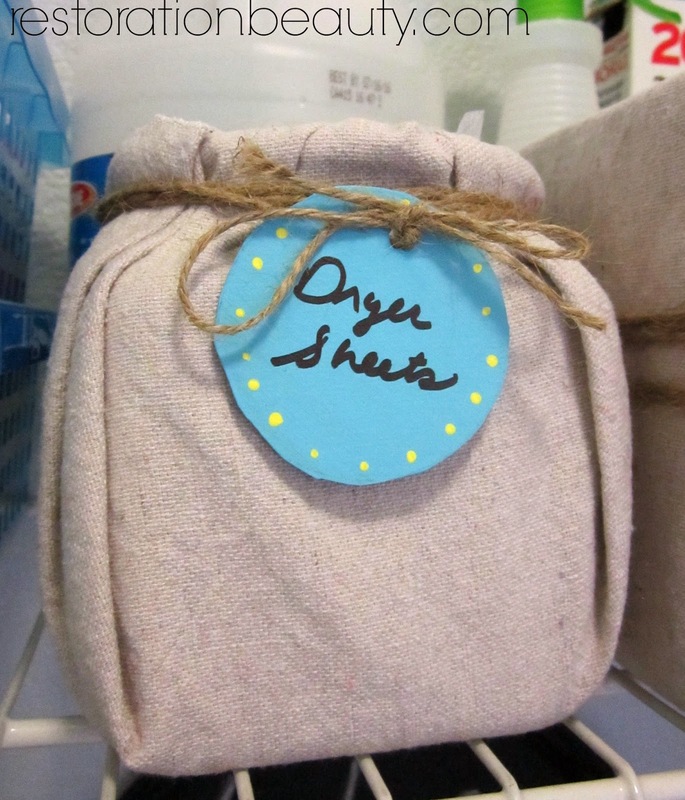 Use dryer-sheets for more than making fabrics softer and reducing static! These babies can double up as ling picker-uppers! 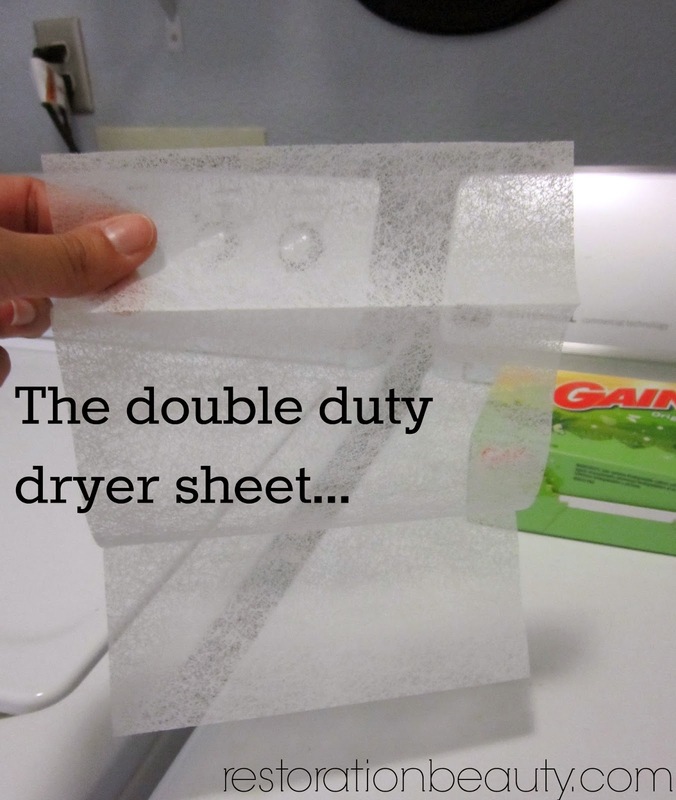 You can use your used dryer sheets each time after you do laundry to pick up all the lint that accumulates on your washer and dryer. 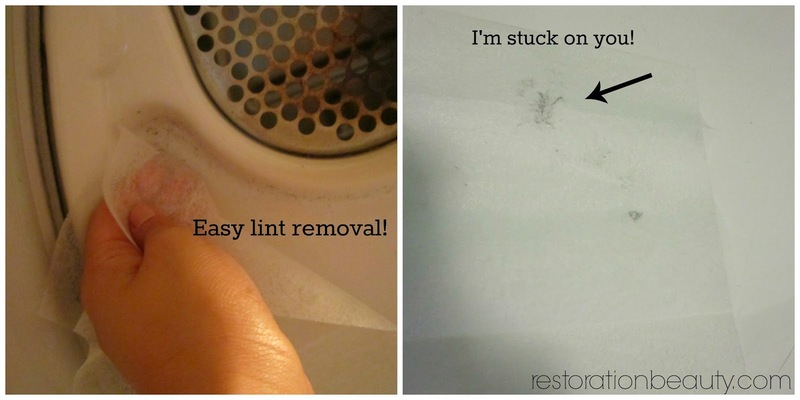 The lint instantly gets stuck on the dryer sheet! Kind of reminds me of a swifter duster so you're not spreading lint around! Or if you're like me and are sensitive to them, you can just use a new one. I hardly throw them in with my clothes in the dryer, only the hubby's. 3. 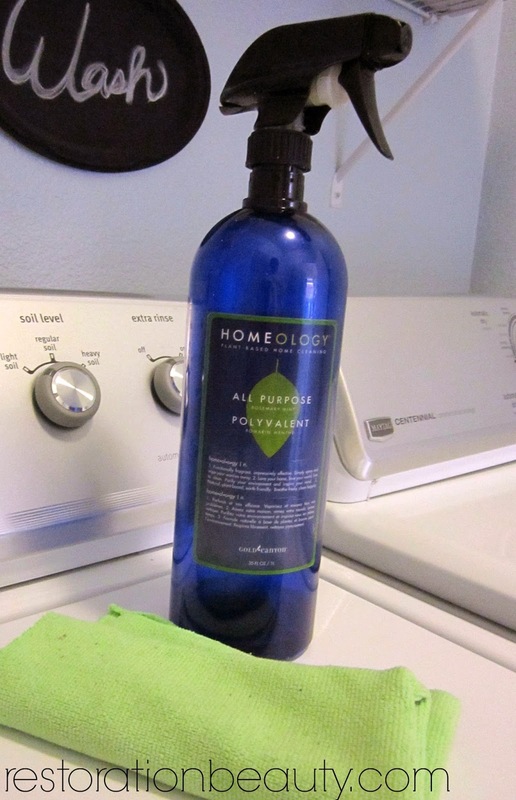 Keep an all purpose cleaner and microfiber rag in your laundry room to do quick (and sometimes thorough) cleanings of your washer and dryer. I always use my favorite all natural solution: 1 part water, 1 part vinegar and 25 drops of lavender essential oil. *You can read about all the other ways I use vinegar around the house here. If you wipe down your washer and dryer after you're done with laundry for that day, you will avoid the dreaded, lint infested machines. 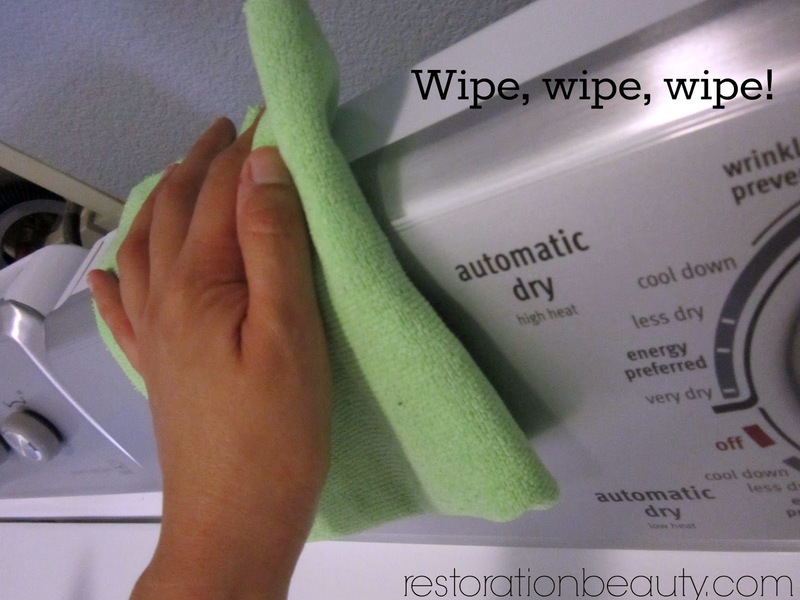 You can also wipe down these sections weekly or monthly, depending on how much laundry goes on around your house. 4. Use a Swifter Duster to clean between and under your washer and dryer on a monthly basis. The gunk that comes out of these places always amazes me! 5. Disinfect your washer to prevent soil build-up and to keep things fresh and clean. Run your washer with hot water and when it's full, add 2 cups vinegar and 1/2 cup baking soda. Close lid and allow to agitate for a few minutes. Open the lid again and allow the mixture to sit for 30 minutes to 1 hour. I do this at least 3 times a year but of course you can do it as often as wanted or needed. 6. 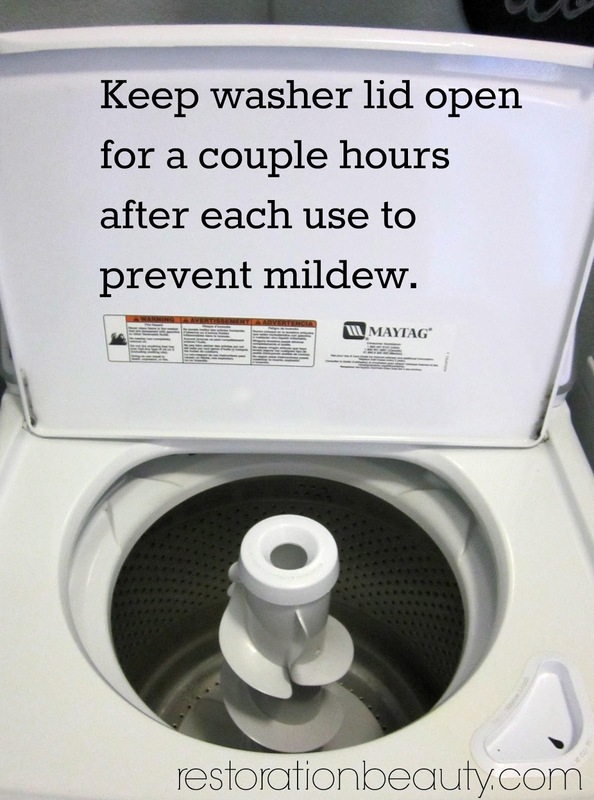 Keep your washer lid open for a couple of hours after you are done washing your loads. And if you're preventing it, you're the smart housewife that doesn't have to clean it up! 7. Use bins and containers to organize like items. Before I gave my laundry room a little face lift, I would just keep all my laundry essentials scattered around on the shelf. They would end up falling and I would get annoyed looking for a particular item. This solution has helped me keep this room organized and clutter free. 8. Keep dirty things off the floor by creating a wall system. Since our laundry room is between our kitchen and garage, I have these wall hooks I keep our outside shoes on. This eliminates a pile of shoes on the floor and the need for me to check my shoes for bugs if kept in the garage. 9. 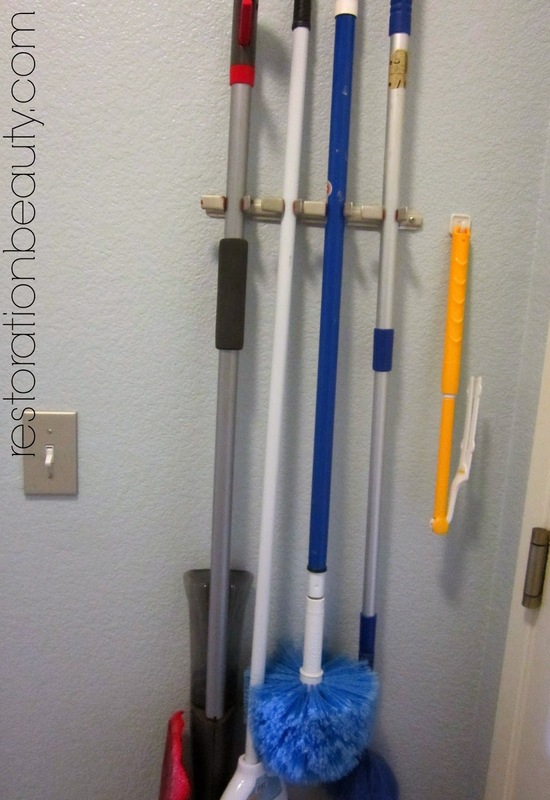 Have a wall storage system for your mops, brooms and dusters. I don't know what I did before I purchased this organizer when we bought our house! I love the fact that I don't have to keep my broom, mop or dusters standing on a corner. 10. 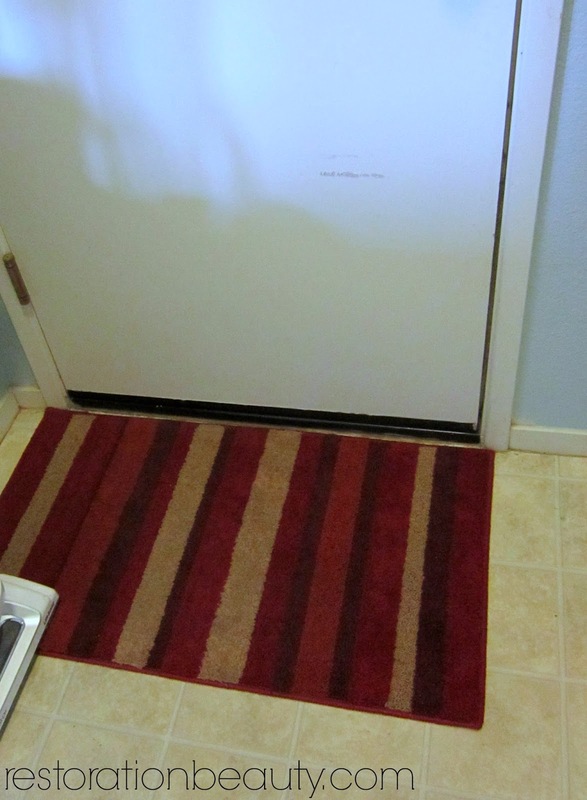 Keep a thick rug by the laundry room door/doors. Again, sine our laundry room leads to the garage (and is the way we always enter the house), I want to keep as much dirt, lint and dust away from the rest of the house as possible. This rug has seemed to do the trick. I just have to vacuum it everyday but I would rather do that then have all the dirt all over the rest of the house! 11. Make a place to keep all your laundry go to recipes. I have this foam board covered with fabric where I hang all my cleaning recipes. I never have to look them back up when I need to remake them or scramble through my kitchen drawers! 12. Do laundry as it comes, or have laundry scheduled days. We're only 3 living here so laundry isn't that bad. I usually do laundry on Mondays and Fridays and it's no more than 3 sometimes 4 loads each day. But I know some prefer to just do a load when there's enough clothes for a load. The point is just to avoid having a gazillion loads you have to do in one day! And that's a wrap, guys! This is exactly what I've been doing since last year and it has helped me avoid the overwhelming feeling of a messy and dirty laundry room. If I have to do laundry I might as well feel good about the room I do it in, right? Do you have any tips on keeping the laundry room in tip top shape? I'd love to hear them! Hi Kristi! I'm happy to know you loved the tips!! Thanks for stopping by! I love this! I want to go get some q-tips and start cleaning now! Could you share your laundry recipes sometime? Thanks! Hi Lisa! So glad you loved the post friend! I would totally freak if I ever found a frog in my shoe!! I think I'd go shoe less for a while! So glad you loved the tips, Madalyn! I went through so many q-tips it wasn't even funny!! But so worth it! And I do plan on sharing them soon!! I really need to try the swifter for cleaning the hard to reach places. Great tips! Oh, Emily!! You will love the Swifter Duster!! 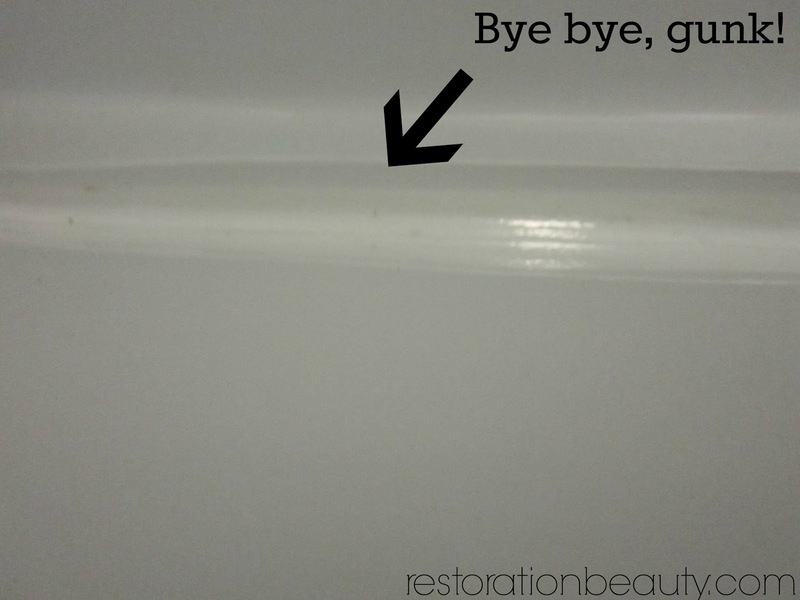 It's so easy and quick to clean small crevices and such! Wow…amazing tips, Selene!!! From few days I am searching for laundry disinfectant tips and from your post, I got all the tips. These tips are fabulous and I would love to use them in my home cleaning. Thanks for sharing this great post with us. I'm so happy to hear you found the tips useful, Emily!! Thanks for stopping by! Glad you found them useful, Lauren!! Thank you! It was a piece of great information and Its really worth reading it. The author did an mind blowing work by describing each and every concept of why should business owners hire cleaning team.